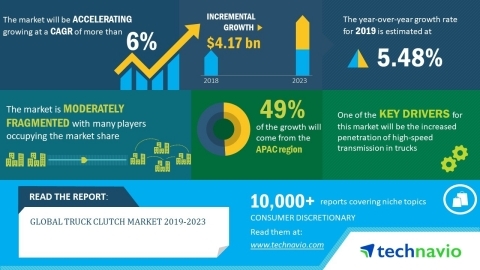 LONDON--(BUSINESS WIRE)--Technavio has announced the release of their research report on the global truck clutch market for the forecast period 2019-2023. This global truck clutch market analysis report segments the market by application (light-duty trucks and medium and heavy-duty trucks) and geography (APAC, Europe, MEA, North America, and South America). The global truck clutch market will post a CAGR of more than 6% during the period 2019-2023.